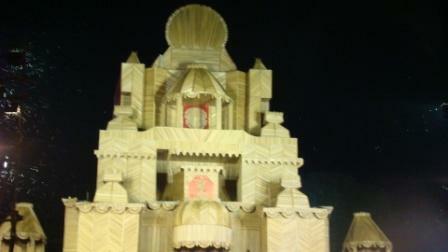 The final day today for visiting pandals, and what a glorious three days it has been! Here are some vignettes from today. That we saw an immense number of people on the streets this evening would be a gross understatement. Let me try to give you an idea. 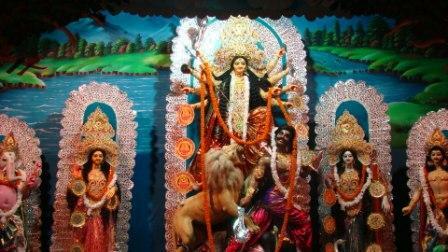 Add all the people on the street at a given point in time on each of the three days of Shashthi, Saptami and Ashtami. Multiple this figure by two. This perhaps would give you an idea of the the crowds this evening. 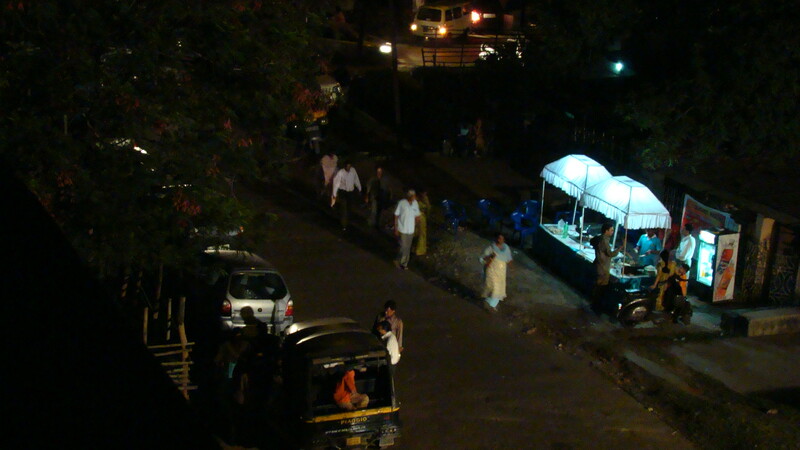 All dressed in their festive fineries and moving on foot, two-wheelers, cars, tempos, SUV’s, buses. (In earlier times, groups of people would even hire trucks for this purpose). More about the crowds, later. 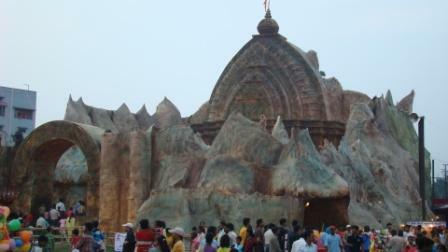 Now a quick recap of the great pandals of Jamshedpur, those architectural marvels. 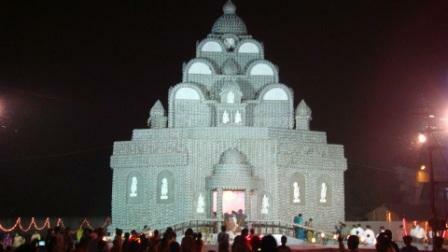 Each pandal better than the other. Each created with creativity and a sense of aesthetics. Have a quick look for yourself. Pardon the bad picture quality. 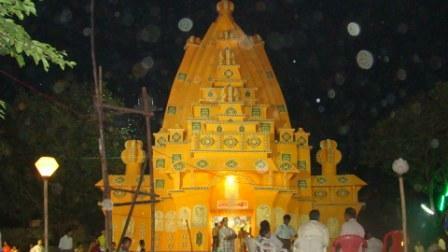 This pandal is made of leaves (tal patra?). 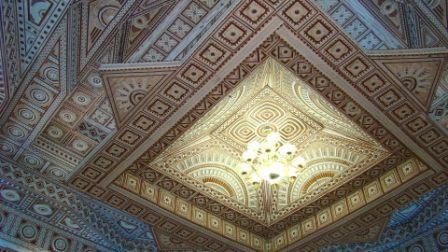 Look at the fine detailing on the ceiling of the pandal. A traditional structure, the ones I grew up seeing in my childhood. This sort must be a rarity these days. And of course the one at the hugely popular Sabuj Kalyan Sangh at Telco where the Protima is placed in an auditorium. 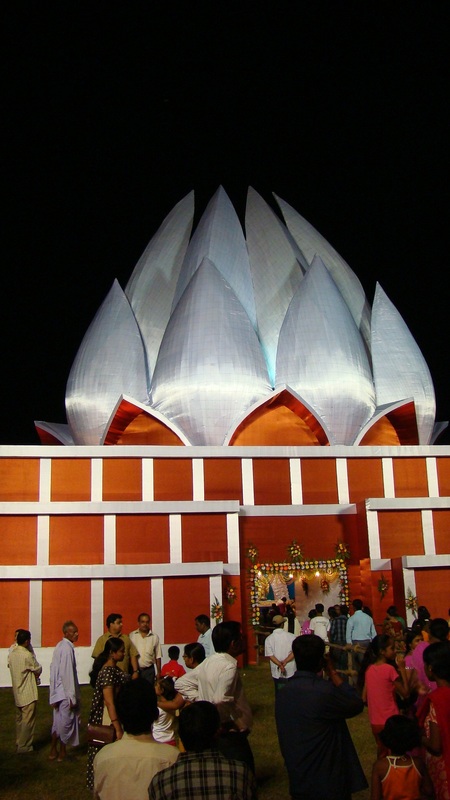 I have been told a lot about the pandal in Adityapur which attracts millions of visitors. So much so that the Kharkai bridge is closed to traffic for several hours starting early evening to pre-dawn to make way for the waiting devotees keen to have darshan at the pandal. 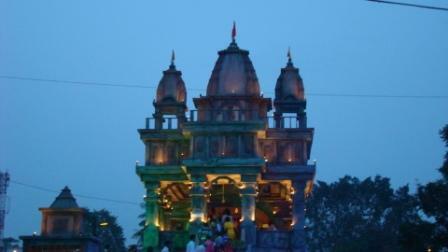 I did visit the pandal, but that was on Panchami day, just after the inauguration, to beat the crowds. But even the crowds we saw today in the Telco area near Sabuj Kalyan, between Golmuri and Sakchi, the stretch between Uliyan and Kadma and at Sonari was overwhelming. Take for example Sabuj Kalyan Sangh, Telco, which attracts a large number of visitors. The crowds were well controlled by the volunteers and security personnel but I still kept worrying about losing track of my children in that crowd of thousands. And I kept hearing constant announcements through our stay at the venue. Like, “Gwaala Basti key Mohan Kumar aap jahaan kahin bhi hon yahan aa jaaiye. Aapki bachchi bahut der sey aapka intizaar kar rahi hai.” Or, “Ghadi park ka Raju….” etc etc. It was quite a task to negotiate our way in and our way out of the Sabuj Kalyan pandal. 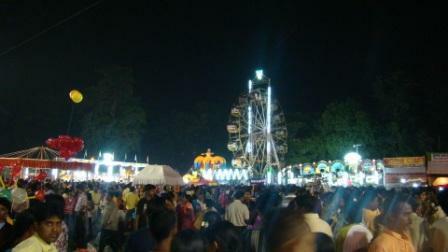 We were tempted to check out the massive mela at the venue, but found the task quite daunting and gave up! Hats of to them in keeping alive the multi-lingual and multi-cultural ethos of the city. And presenting to the visitors remarkably well-made pandals, most, of course, being near replicas of well-known temples and architectural landmarks. All made by creative artists from all over. 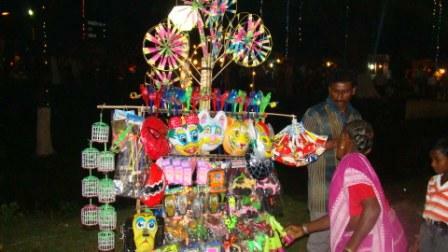 In Jamshedpur, Durga Puja festival is not limited to Bengalis alone but it belongs to all! But where is the Spring-Monkey? The hunt for my spring-monkey has drawn a blank. Those following my posts on Puja over the last few days would have read about this search. I have lost all hopes now after four days. I do not think my spring-monkey will be available again. Life needs to move on, and I should stop fretting about this. Some may wonder why I hold the spring-monkey so dear and why its absence saddens me so much. Maybe one day I will do another post, a post devoted to my spring-monkey. 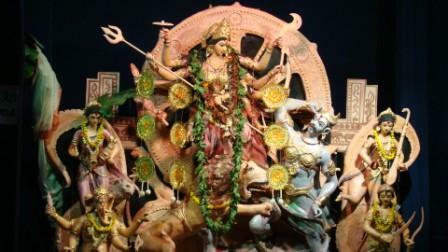 You may want to read the coverage of shashthi, saptami and ashtami. It is one am (night of ashtami/ navami) as I write this piece sitting on the terrace of our house. 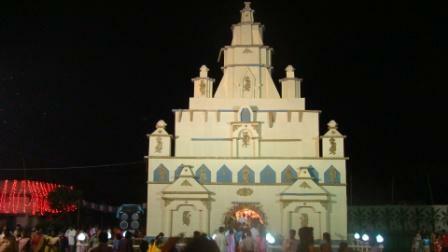 I can see streams of people making their way to the neighboring Puja pandal walking up-and-down wearing new clothes. Old people, kids, boys and girls…all! And this in an otherwise quiet street whose residents go off to sleep at 10 in the night. That is the excitement of Pujas in Jamshedpur. My mother, who wakes up very, very early says that the only quiet time is after four in the morning! 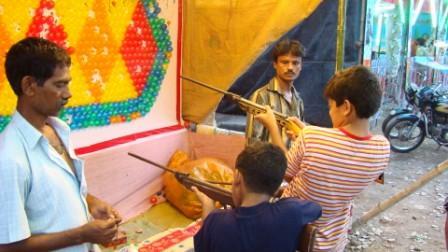 Maha Ashtami was a relatively quiet day for us. Quiet in the sense that we did not venture too far from the house today. I woke up rather late (Pitaji had organized the bhog coupons again!) and lazed around listening to the sonorous chants of the Durga Path emanating over the loud-speaker at the nearby pandal. The ladies of the house, my mother, my wife and my sister who stayed over at our place went to participate in the puja in the morning carrying their puja offerings. My contribution to the proceedings was accompanying my sister later in the day to the pandal to collect their puja offerings and, yes, the bhog! While I got the offerings, my sister queued up for the bhog (the ladies’ line for the bhog collection was shorter, hence this arrangement!). As I was waiting for sister to surface with the bhog, I could see a queue of maybe a hundred men standing patiently in the sun with their empty jholas over their heads as a sun-shield awaiting their turn for the bhog. And it was the heavenly khichudi moha-prosad again for lunch! Then in the evening a stroll (if you can call weaving your way through massive crowds a stroll) to two neighbouring pandals with my father for darshan of Maa Durga. Father needs assistance in negotiating the roads in the evenings and I was the guide. A far cry from the days 30-35 years ago when my father would hold my hands and gently move me through the crowds at multiple pandals. The high point of this trip was that we could see the arati at leisure. I have taken a few videos of the arati, and especially of the dhakis but the file, alas, is too large for me to post it here in the absence of a broad-band connection. There was this troupe of 5 dhakis who put up a mesmerizing show complete with a hyper-active kid dhaki and a couple of dhaks with the traditional plumes. 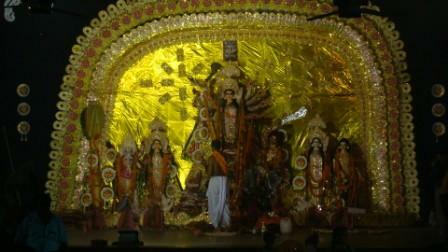 Later in the evening a trip with my wife to the “Bot Tala” pandal which is a little further away from my house. 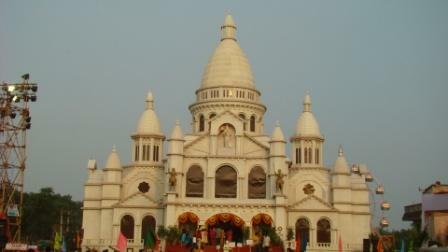 Bot Tala, Sonari, Pandal. Replica of a Church? 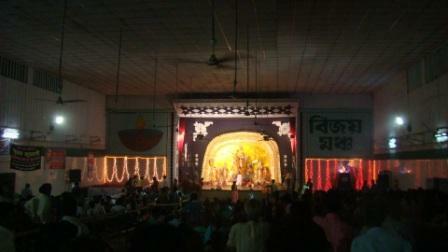 And back again to the para’s puja pandal to hear some fine Asha Bhosle adhunik songs. “Mohua jomechhey”, “Phooler gondho nei”, ete etc; all songs from my teenager days! As I was watching the proceedings from the terrace later at night, the pandal had a Kishore Kumar clone who sang passably well first in Bengali (again my favorite adhunik songs of Kishore Kumar) and then some Hindi ones from movies like Amanush. I understand there are no jatras nowadays, at least not in our para puja. Wonder why, and since when it has been discontinued. Must check tomorrow. Tomorrow is Navami and it is reserved for some big sight-seeing, Telco area, Kadma, etc. We will yet again have the able brother-in-law to steer us through the day. And yes, I did keep a keen look-out for the spring monkey. No luck. But then today I was only revisiting the pandals, maybe tomorrow’s location would prove lucky! 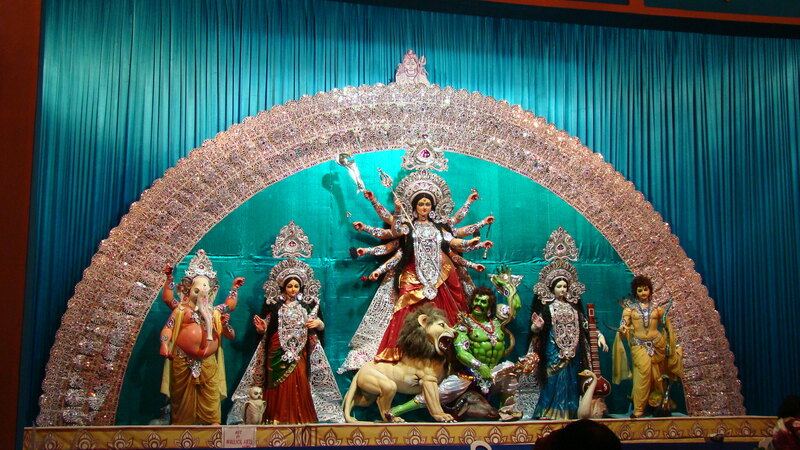 You may want to read the coverage of shashthi, saptami and navami. Ah, Saptami! Finally the real action starts today!! But first, the Bhog coupons. I knew I would not be able to wake up early enough to get those limited edition coupons, so I had requested my father in advance to do the needful. 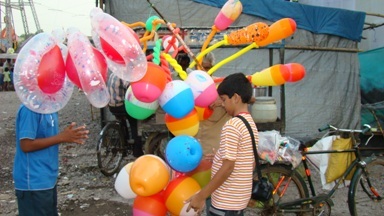 And it was finally a kind neighbor who saw my father walking to the Puja Pandal and volunteered to get them. Coupons obtained, and it was time to see some dear relatives after a late, late breakfast. We got back home late but there it was, the Bhog! All set on the dining table complete with the special vegetable and payesh. And a little helping of pickles as well! Bhog, after 18 years! Some of you may know of my fondness for khichdi, but Bhog transcends any definition, way beyond a mere khichdi! That consistency, that right level of spices and the right level of sugar. And the earthen pots it is served in adds to the flavor. No wonder it is called “Moha-Proshad“! Two more days of this heavenly dish! Bliss!! 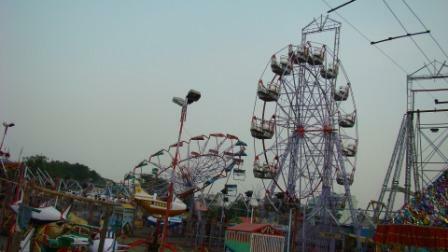 Today was also the day for exploring some of the grand pandals of Jamshedpur. Or a lesson in grand architecture from around the world. 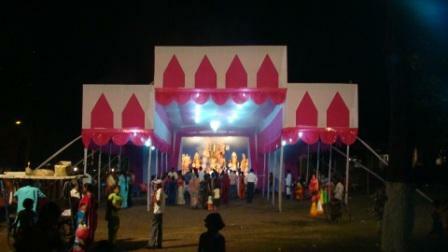 First stop at Bhuiyandih Puja Committee’s Puja Pandal. This is a replica of the Sacre Coeur Church of Paris. Perhaps it looks better than the original! 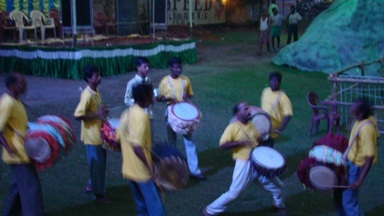 Then on to Kashidih at the “Thakur Pyaara Singh Dhurandhar Singh Club”. This one is gigantic, probably based on Kailash Parbat. Or was it Kedarnath? 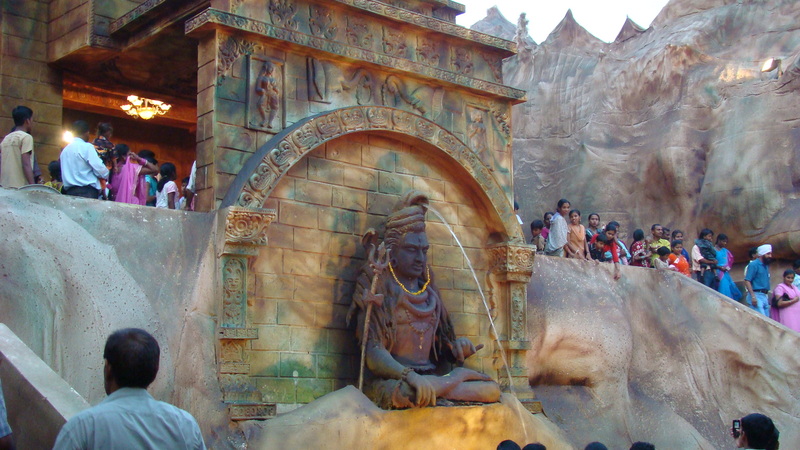 Complete with huge statues of Lord Shiva. And what detailing! Truly majestic! And the 3-storey temple structure at L-4 Area, Sidgora. I was not able to place which famous temple this is based on, but it was impressive! 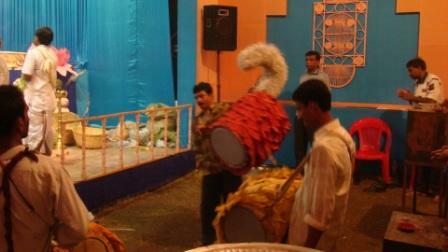 And the dhakis playing at the pandal were on a divine trip of their own. Each one of them in his own trance! Care for Harry Potter’s school, Hogwarts? 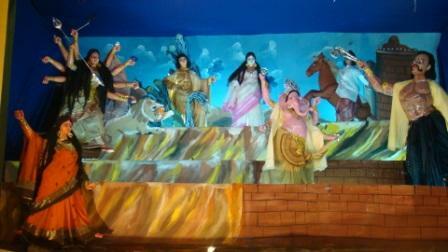 Find it at New Sidhgora Puja Committee’s pandal at the “Cinema Maidan“. My elder son, an avid fan of H. Potter freaked out on this one! 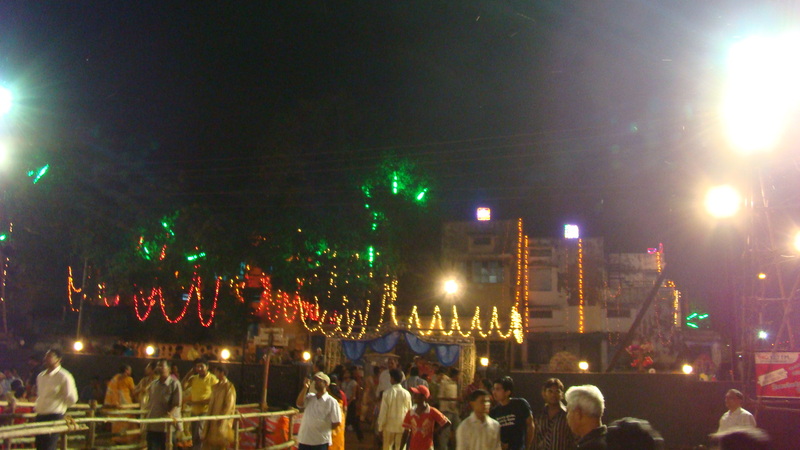 Then on to Thakkar Bapa Club at Dhakidih. An ethereal structure drenched in moonlight it seemed! 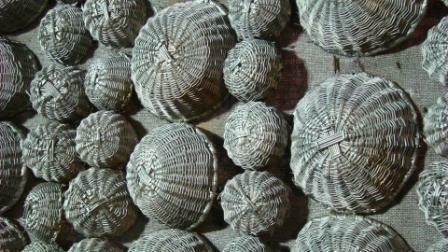 A closer inspection revealed thousands and thousands of silver-painted baskets which form the façade of this pandal. Check-out the close-up. And then onto a Puja which is not famous for the pandal. 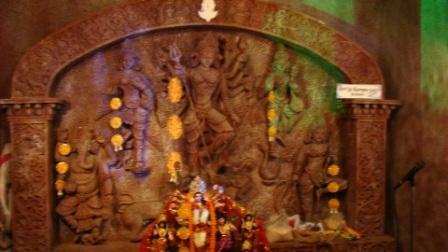 But I rmember visiting this Puja each year when I was a kid. 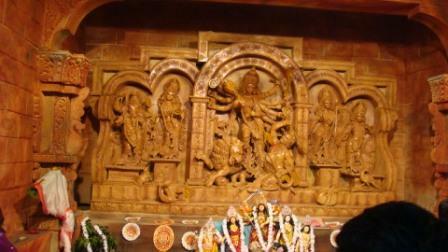 The Puja at Utkal Association. The USP of this was that the Protima was made in the same colour, year-after-year. In an off-white colour. (“Champa” colour is what one of the organizer told me today) However, this year, for some inexplicable reason they have the Protima in a mauve shade! Nothing wrong, but just that it felt a bit odd to see a non off-white statue there! We covered a fair amount of geography today thanks to my brother-in-law who was driving us around. I am glad he offered to do this. He took us to some of the best pandals. He knew exactly where to go and how to reach there despite some crazy traffic and with many key roads being closed. And he could always find parking close to each pandal. So minimum walking for us. Taxi hire costs Rs 300 an hour during the Pujas! Even the humble tempo (auto-rikshaw for the non-Jamshedpurian) costs Rs 100 an hour! I had hired a car for 12 hours a few days earlier and paid just Rs 675! What a rate escalation for the Pujas! When we were kids we would clamber onto Pitaji‘s Lambretta scooter, the youngest kid standing in the front with two or three kids sitting behind Pitaji. 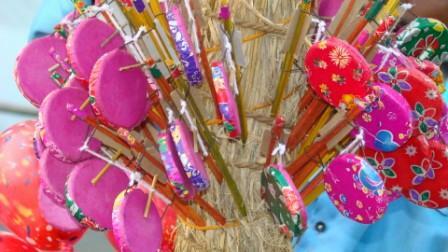 We would carry a wish list of the pandals we had planned to see. 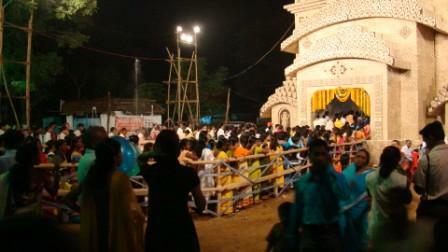 On return home each of the pandals seen was ticked and heated discussions took place on the favorite protimas. I do not remember any discussions around favorite pandals. Probably as they they were all of pretty much similar quality, give or take a unique design element or two. Another wise decision taken by my brother-in-law was to separate pandal-hopping from eating. So we had phuchkas (divine!) at the vendor next to Bengal Club, the dosa at Utkal Association (dosa crust and chutney to die for!) and egg-chicken roll (encasing succulent chicken kababs) next to Regal Cinema at Bistupur. When you need to eat, why not choose the best? All of us took turns at doing the Abhinav Bindra trick; Rs 5 for 5 shots. And tons of balloons to burst. So you had to be shooting in completely the reverse direction to miss bursting a balloon with any shot. And eyeing the jhoolas but too scared to climb atop fearing safety. But some discouraging news on the spring-monkey front. Even today, after some diligent search, I was unable to locate the spring-monkey I referred to in my previous post. Maybe tomorrow will be my lucky day! 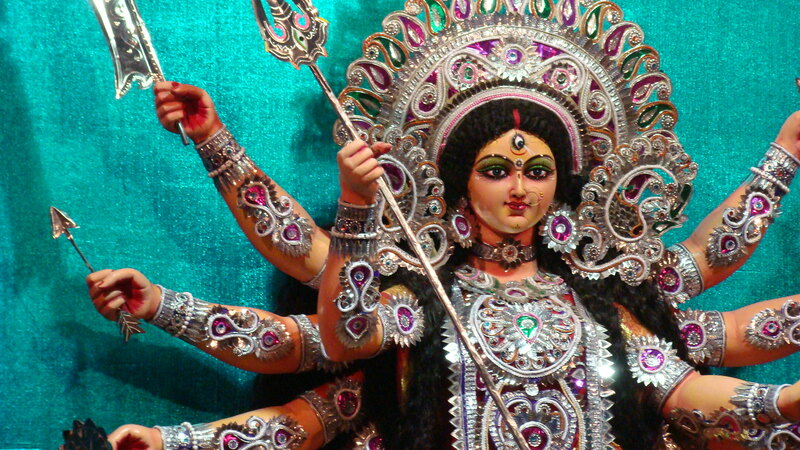 You may want to read the posts on shashthi, ashtami and navami. 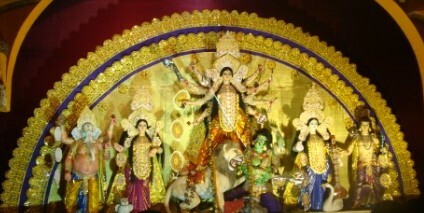 Today is Shashthi, the real action starts tomorrow. 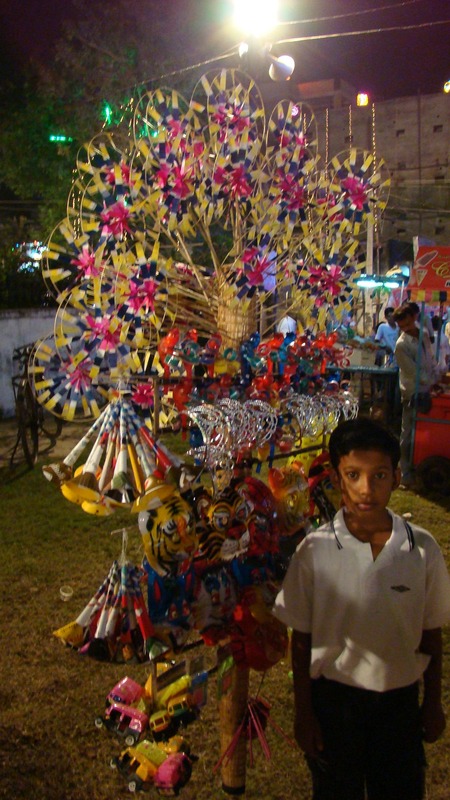 But I can’t wait and I round up my family to take a small chakkar of two of the pandals close to our house. 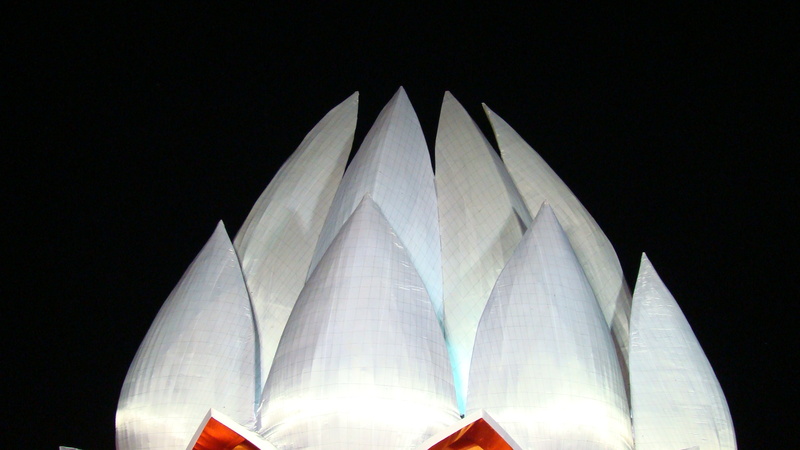 The first one is modelled on Baha’i faith’s famous Lotus Temple at Delhi. 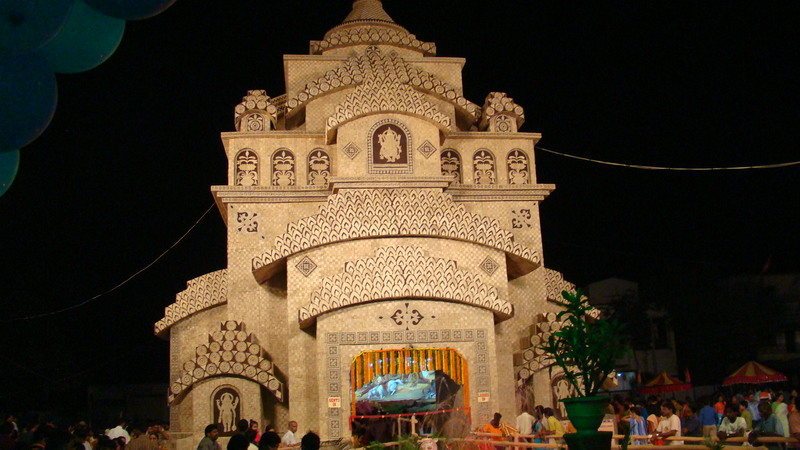 The other Pandal is also grand, and is obviuosly modelled on a temple. 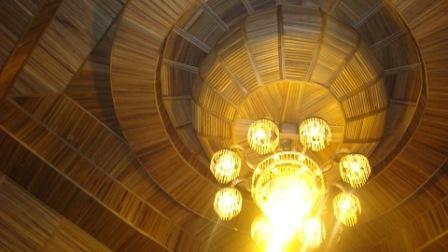 It is intricately made from cane and bamboo. Yesterday, while visiting my sister in another part of Jamshedpur, we were taken to two pandals which we were told were among the grandest in the city. One was modelled on a Khajuraho temple and the other was shaped like a gigantic boat. I have the pictures on my cellphone and once I figure out the blue-tooth business will upload them later. So, the tarpaulin and shamiana fixtures of yore have given way to architectural marvels. However, the traditional Protima remains as grand as ever. The ubiquitous toy-sellers are there aplenty, but I could not find the spring-monkey which I planned to buy for my sons and for a friend in Bangalore who wants it for his son who is now in 10th std! There have been many changes, like the masks which were earlier made of paper now come formed in a plastic sheet. I offered to buy some for my sons, they firmly declined my offer. Even my little nephew, seen in the picture below would not let me buy any of the toys on display. But over-all a great festive air around the place! The three main days start from tomorrow. 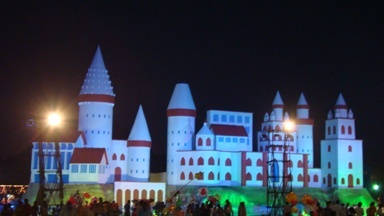 There are many Protimas and pandals to be seen. And the spring-monkey to be located! And yes, I have to buy those bhog coupons at 7 in the morning tomorrow. The coupons may sell out, I am warned by the organizers, so I had better be early! I am feeling hyper-excited. I will be visiting Jamshedpur for the Pujas after 18 years! 18 whole years! 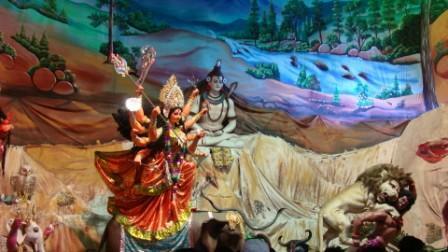 I stay in Bangalore and I will travel with my family to be there in Jamshedpur for the Pujas. My sons, now 14 and 12, will be there for the Pujas at Jamshedpur for the first time! I know I will miss the Mahalaya at Jamshedpur, that joy of waking up before dawn and listening to Chandi-Paath in Birendra Krishna Bhadra’s voice in the old Murphy radio. But I will pull out the two-volume set of cassettes I have and listen to the paath pre-dawn in Bangalore just as everyone is around the country! I am looking forward to sitting on the terrace (“chhat”) of my parents’ house listening to the beats of the dhaak through the evening. That throbbing beat which makes you want to jump up-and-down, swing sideways, clap and generally get into a trance. I want to dance and give myself up to the joyous excitement of the pujas. I would have liked to be there arguing with the localities donation (chanda) collectors about the amount of contribution we could make. But perhaps I will be too late for that. The chanda would have either been committed for or collected already. I look forward to wearing a set of new clothes each day of the Pujas, Saptami, Ashtami, Navami and Bijoya. I have ensured that my children and my wife too wear new clothes. And as a surprise I have planned for my parents who are in their 80’s and 70’s, (father is going on 84 and mother on 79) they will wear sets of new clothes each day of the pujas. Just as my parents ensured with my father’s meager earnings that all six of us siblings could do so. I will buy all the pujo-barshikis and try and read some of it. So what if my fluency with Bangla script is a bit rusted now. And I will certainly read Shankar’s (Mani Shankar Mukherjee of Chowringhee fame – among many others) story if he is still writing. 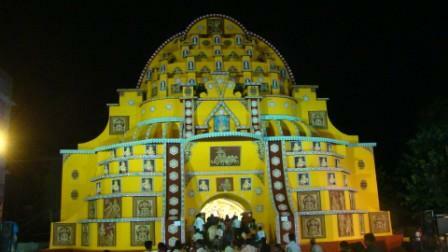 I look forward to the trips to the puja pandal where I can bow to the Goddess and seek her blessings. Not before I lift my children (I am sure much to their amusement, and embarrassment) to enable them to get a darshan of Ma Durga. Just as my father did when I was a kid. I have planned to buy for my children the small toys I used to enjoy when I was a kid. That water-filled rubber balloon slung on a thin elastic rubber tube which served as “yo-yo”. That plastic monkey which slithers down the spring-like stalk as you turn the toy up, and then down. I want to be a part of the aarati competition each evening. Not as a participant, of course, but as a member of the audience. I want to smell the sweet, intoxicating aroma of dhoop as I stand in the crowd watching the aarati dancers to the beat of the dhaak. The dhaakis going round-and round in their own trance. My youngest sister who won all the aarati competitions she took part in will not be there as a participant but I will still cheer all those who do participate. I would like to treat my family to phuchkaas, son-papadi, ghughni, chicken-rolls and other such heavenly snacks from the sundry vendors stationed around the pandal. I would love to buy the coupons for the khichudi moha-prosaad and have the prosaad for lunch each day. That heavenly sweetish khichudi with kumdo vegetable. 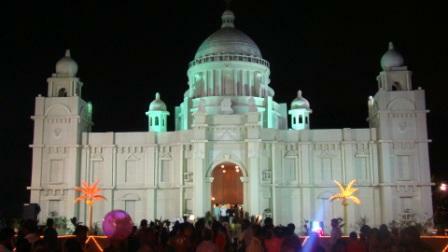 I look forward to hanging around the para’s pujo pandal in the evenings. Who knows, I may be lucky and able to spot some of those girls who I used to eye when I was a teenager! Never mind if they are all married and with grown-up kids! I can still introduce my kids to their “aunties”! 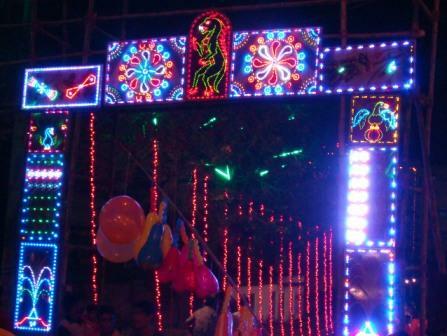 I plan to sneak behind the pujo-pandal and grab a few surreptitious puffs of a cigarette away from the vigilant eyes of Jethi-mas, Jethu, Kakus, Kakis, Pishi-mas, pishi-moshays and everyone else. If they still have jatras, I will watch at least one show braving the late night chill. And cry unabashedly at the predicament of the hero and the heroine. I do not have text-books any more but I will carry whatever books I will have with me for reading in the vacation to the puja-pandal on the Bijoyadashmi day to seek Durga Maa’s blessings. And watch the women of the para applying sindoor on each other. 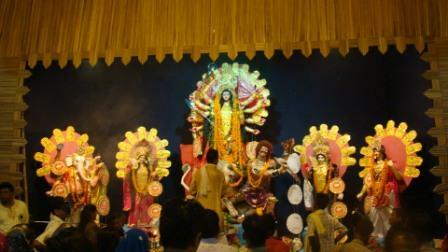 I shudder to think of the women crying on that last day of the pujas grieving about Durga Ma’s departure for the year. I think I may end up crying too! My kids and I would line up the street and watch the immersion procession with me holding my kids’ hands. Cheering each grand statue as it passes by. I would go to each of our neighbour’s house in the evening and touch the feet of the jethus and jethi-mas and do kola-koli with all my childhood friends. And eat mehidaana, sondesh, ghughni and loochi. The day after Bijoya, I will go over in my mind the days just gone past reveling in the memories. 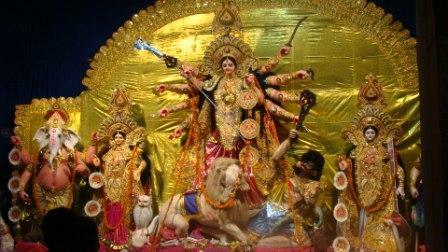 And plan my trip to Jamshedpur for the next year’s pujas. Oh to be in Jamshedpur, for the Pujas!